We managed to finish breakfast just around 13:00 (it seems some of the boys were up a bit late last night) and headed to the train station where, of course, we missed our intended train and after much hassle at the ticket machines (France seems bound and determined to reject our card at every turn) we took a short but sleepy ride to Versailles. We got an early start on the 14:00 train to Versailles. We were greeted at the palace by the esteemed Jean-Baptiste Robin, one of the organists at Versailles, our guide from Poitiers two days ago, who sidestepped a few velvet cords to give us VIP access to the chapel and the palace, which he described to us as a “prison of pleasure.” After ascending yet another historic spiral staircase, we found ourselves face-to-face with the lavishly gilded organ of the Royal Chapel. 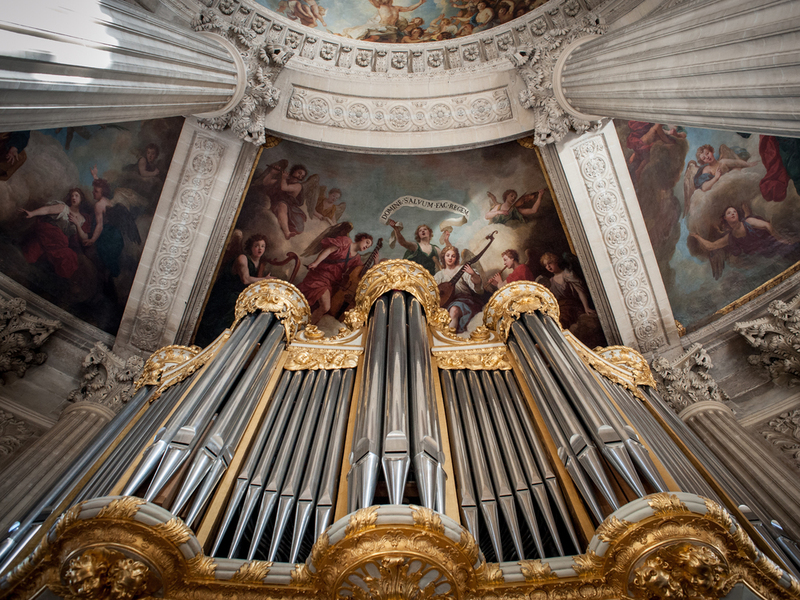 Now, I don’t claim to know very much about French organ music, but I’ll save you the Google search and give you the scoop about this organ. 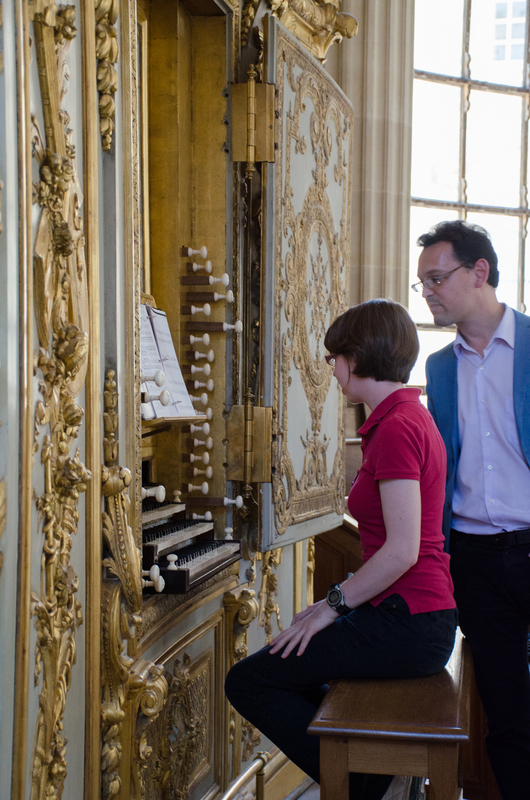 Newly built in 1995, this organ is a reconstruction of the original French classical organ built for the chapel in 1710 by Robert Clicquot, the grandfather of the builder of the instrument in Poitiers — a new organ built into the original 18th century case! The organ occupies an unusual position over the altar, facing the king, who would sit in the back of the chapel. It has four manuals, a small pedalboard, 58 ranks, and 37 stops. 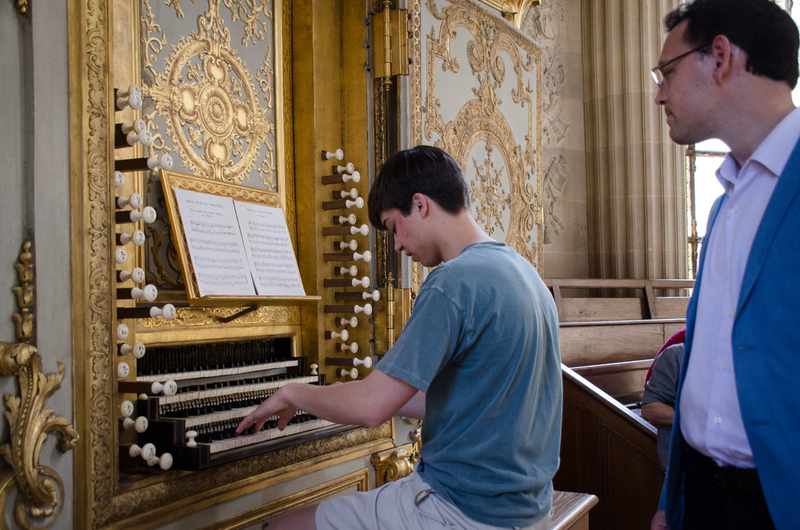 After Jean-Baptiste’s demonstration of the organ, each of us took a turn at the console, sending French Baroque music echoing around the splendor of the chapel. In the absence of said tourists inside the chapel itself, a few of us took the opportunity to soak in the sun streaming through the windows and bask in the swirling harmonies. 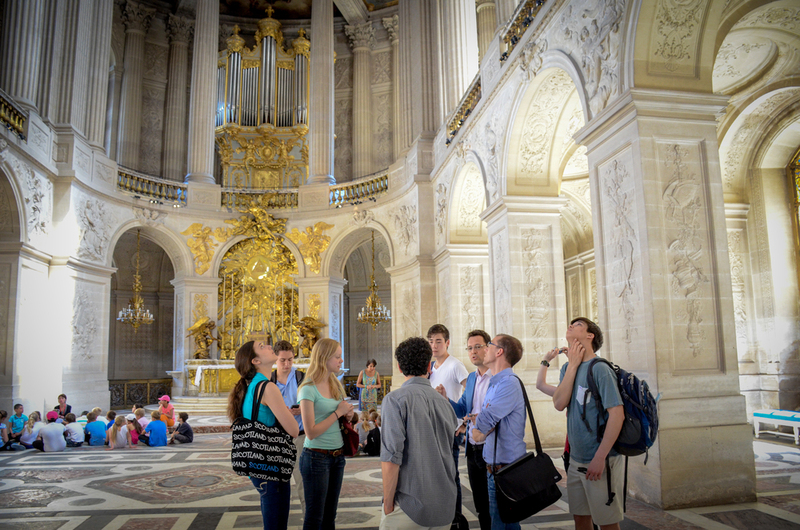 If I never become famous, at least I can say I’ve played the organ at Versailles! 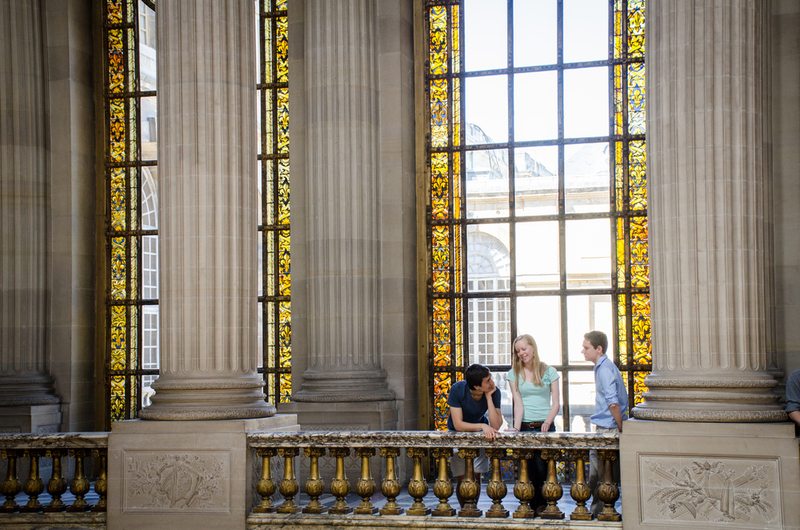 …while Noel poses for Abercrombie Versailles. 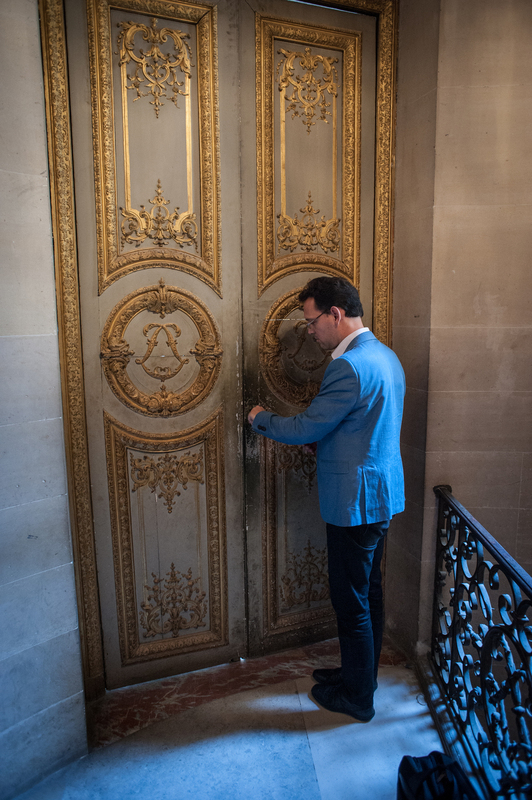 We finally and reluctantly closed the doors on the organ console (because let’s face it, this is probably the first time that we can say, “I played the organ at ____!” and actually impress some non-organists) but we still had the whole palace to explore! 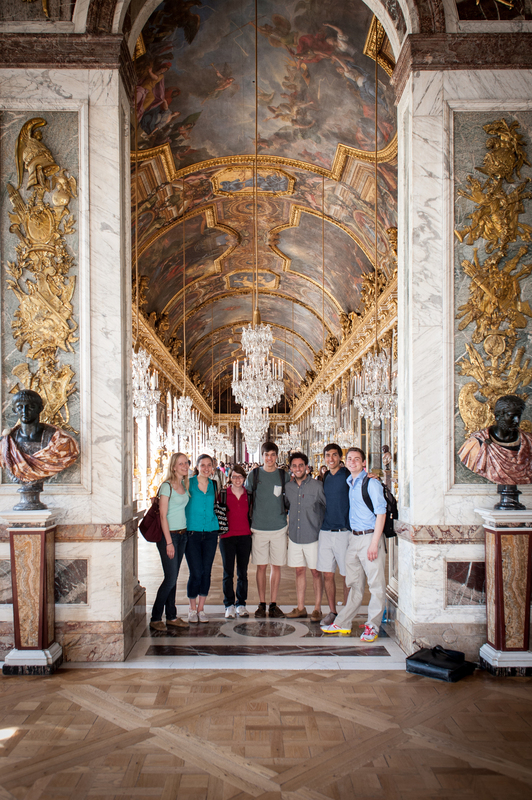 We wandered through numerous bedrooms, receiving rooms, dining rooms, and galleries, all of which I’m sure you can find photos of online, but my favorite part was walking through the Hall of Mirrors. 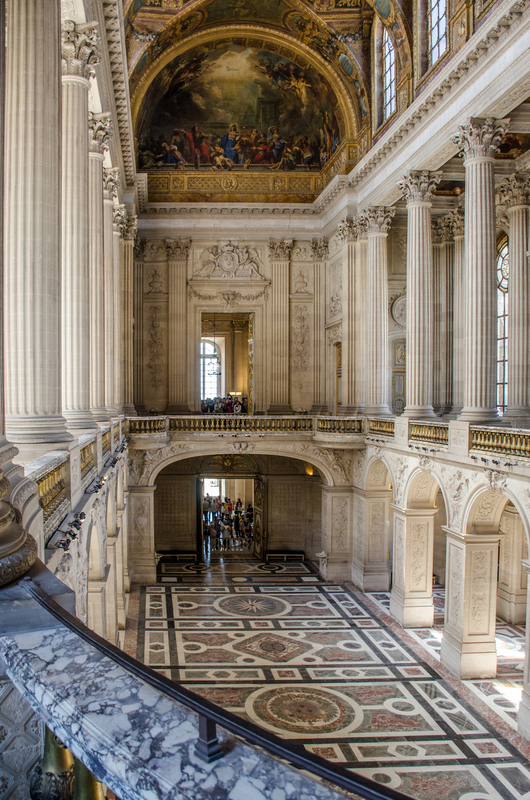 It’s one of the only parts of Versailles that I could recognize from a picture, and it just felt really thrilling to be there myself. It helped cement the reality of this trip in my mind as I start to realize that we are really in Paris and it isn’t all just a dream. 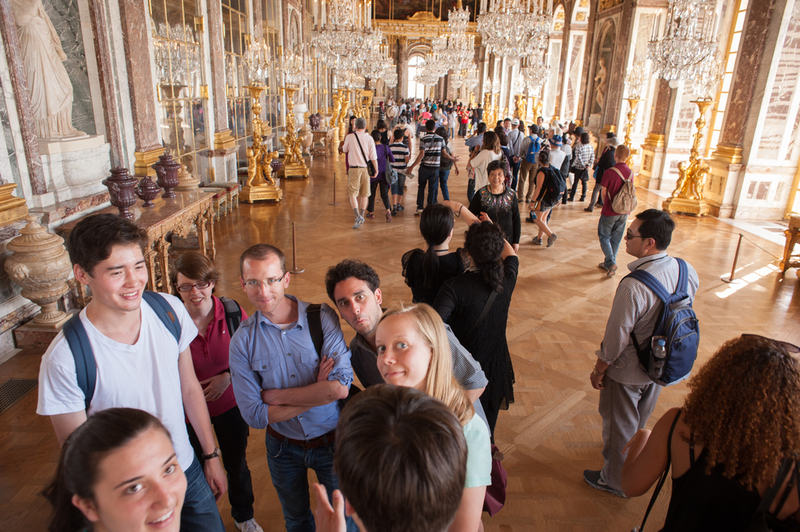 The Hall of Mirrors – like a dream! Of course, our stomachs started rumbling around 17:30 so we made a pit stop for “lunch” in the museum cafe (apparently our stomachs never adjusted to the time difference) where got a little too excited about spending exactly 100,00 Euros. Afterwards, we decided to check out the gardens and were met with a maze of hedges, shrubs, ponds, and fountains to navigate. We set off towards the north winding our way through gravel paths, the towering shrubs reminiscent of the hedge maze from Harry Potter and the Goblet of Fire. Along our wanderings we encountered a (maintenance) path less traveled, a cathedral of trees, and a few secret gardens, but as is our luck, we were just too late to rent a rowboat on the expansive Grand Canal. Still, we stopped to dip our feet in the canal and enjoy the view, where we took our second collective nap of the day. Gianmarco and Noel acquainted themselves with the wildlife while they fed the fish pieces of a Clif bar. Now where is the organ? Organists are a sedentary species. We finally roused ourselves from the lawn and ambled back to the train station where we took our third collective nap on the uneventful train back to Paris. Upon our return, we glimpsed the sunset over the Seine and contemplated the pros and cons of jumping onto one of the dinner cruise boats from a bridge, but decided in favor of hitting up our favorite supermarket (this time before it closed). Chris, Joey, and Gianmarco whipped up a delicious dinner of pasta, shrimp, vegetables, and chicken (at our ever-later dinnertime of 23:45) and Noel earned the title “God of Chocolate Mousse” for making us a very tasty dessert. 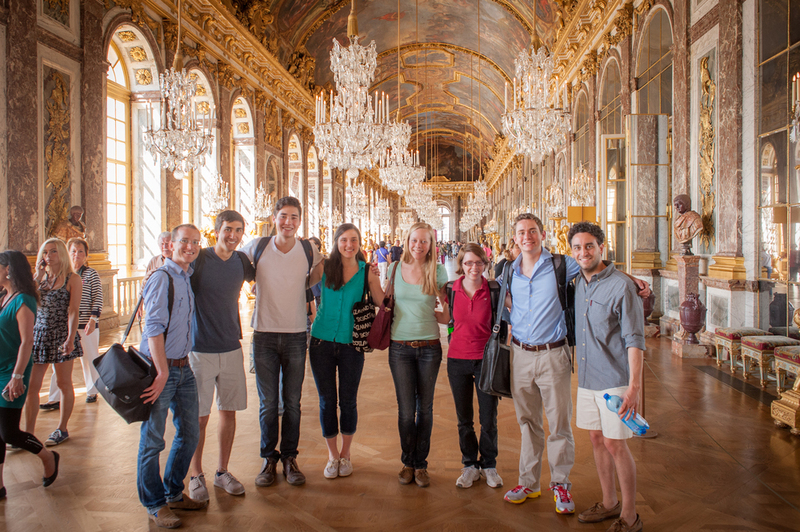 All in all, it was a well-balanced day: relaxing in the morning, playing organ in the afternoon, and exploring Versailles in the evening, finished off by a home-cooked meal in good company!